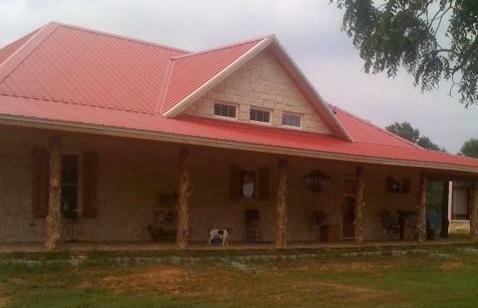 Another DAL Designs ranch house, this home is located near Centerville in Leon county. Designed for an older couple who wanted a quiet place to retire, the home features an Austin creme stone veneer, rustic standing-seam metal roofs, and wraparound porch – something of a Hill Country style home with French Colonial influence (the rough-cut cedar columns were all cut from trees already on the property). Inside, a large open living area, dining, and country-style kitchen lies below a true cathedral ceiling. Overall the house is 1,600 square feet of ADA-compliant living area plus 1700 square feet of covered porches and an attached three-car carport. the rough-cut cedar columns were all cut from trees already on the property.